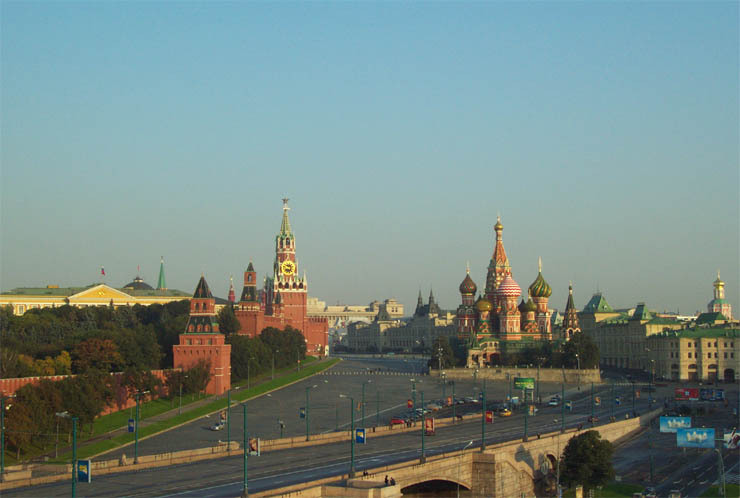 In 2003 I made my sixth visit to Russia over five decades (1969, 1978, 1989, 1990, 1991, 2003). 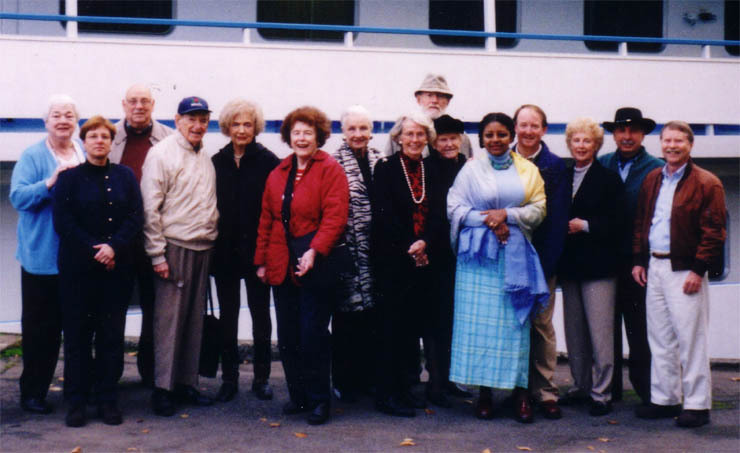 I made this trip with 14 other Circumnavigators - See photo on far left. Our guide, Sasha was just outstanding! I have segmented my report into 5 parts: Russia and Moscow, Star City, Volga River Cruise, St. Petersburg and Ayn Rand sites in St. Petersburg. The changes since 1991 are dramatic and the changes since 1969 are so fundamental that I prepared the following table to give you a snapshot impression between 1969 and 2003. Below the table is a further analysis of Russia in 1969 and 2003 based on my observations. 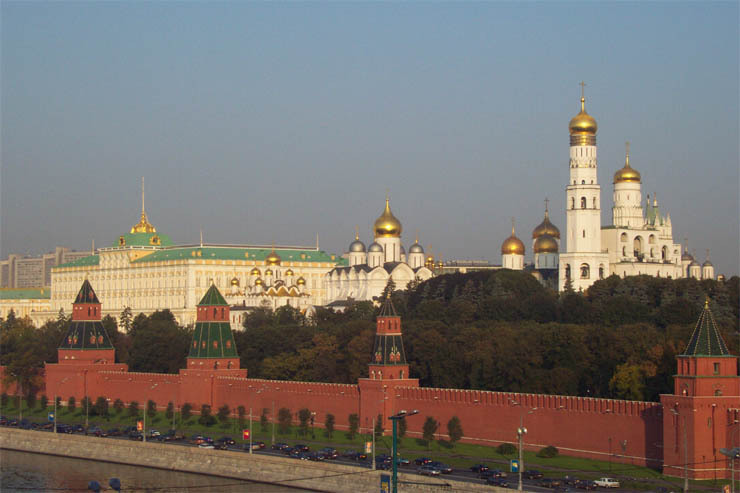 There are also a few photos of Moscow tourist sites at the bottom of this page. Number of times zones? 11 11 Russia remains the largest country in land area. Russia, a superpower? Yes No In 1969 Russia was one of the two superpowers and was feared by other countries. Climate of Fear? Yes No This is one of the dramatic and profound changes. Communist slogans on roofs? Everywhere No In 1969, red and white banners proclaiming Glory to the Communist Party or Workers of the World Unite were everywhere. Statues of Lenin? Everywhere Ony major ones in place A surprise to see statues of Lenin still in public parks. Part of our history say Russians. Store signs? Few Nicely done In 1969, stores would have simple names like Bread. There were few signs and no advertising. Now store signs meet best world standards. Standing in lines to shop? Always No Even to buy milk required standing in 2 separate lines in 1969. People stood in lines for hours every day. Tipping? No Yes In 1969, due to fear of or belief in Communism, all tips would be refused. Buy American magazines? Of course not Yes In 1969, no Western publications were available at all. All news tightly controlled by Government. Access to Internet? No Yes A trick category, but Communism feared the Information Age and tightly controlled all information. Copying machines and faxes were major threats. Now internet cafes common. Freedom to travel? No Yes In 1969, foreign travel was a threat to system because people defected to the West. Society focus on Floor Ceiling This is why communist countries are never wealthy. Percent of people with Soviet mentality 90 to 95 30 to 35 Dramatic improvement, but still a problem for another generation. Number of political parties Only 1 Many Russia now has a standard voting option of "None of the Above" (literally "Against all"). Wouldn't this be nice in the USA?! Russia integrated into world economy and standards No Almost In 1969, Russia was in self imposed isolation from the world. Joining WTO will be a key step. Number of McDonalds in Moscow 0 90 No concept of fast food in 1969 and no American products for sale at all. Number of cars in Moscow? Few 3,000,000 Traffic jams today, but still no parking meters. Percent cars made in Russia 100 50 Another example of integration with the world economy. Public Begging? No Yes Now similar to western countries except for the elderly poor. Seeing toothless grandmothers selling flowers made me cry. Taxation? Indirect and hidden 13% flat income tax Communism hid the real tax rate in the price structure. Now ironically Russia has a more advanced tax system than the USA. Flasification of economic numbers? 30% up 30% down Under communism, numbers were falsified upwards to show 5 year plans succeeding; now downwards, to avoid taxes. Real standard of living is the best it ever has been in Russian history. Life is best for? Retired people Working people The old people were victims of Communism at the transition when the value of the ruble was destroyed. How are people feeling? Secure Uncertain Communism was a huge wet blanket smothering people with certainty, inefficiency and an inability to make their own decisions. Signs in English? Unheard of Some Still an area for improvement. Tokyo has all street signs and subway signs in English, but Moscow does not. Toilet quality? Bad Better Still an area for improvement. Outside of Moscow and St Petersburg, one person in six lacks indoor plumbing. American tourists special? Yes No In 1969, Russia was the most pro-American country for tourists that I have ever visited. Now, in another sign of normalization, we are no longer special. Does Russia have a soul? Yes Yes There may be a better way to explain it, but Mother Russia has a special appeal. In 1969 Russia was in its own sphere deliberately cutoff from the world. It was the self-proclaimed leader of a radical economic and social system which was supposedly better than that of other countries. This was a totalitarian system which aimed to change human nature. Everything about the system was ideological and it was geared to prove that communism was best -- regardless of the facts. Prices were not based, as in other countries on the basis of supply and demand, but on ideology. So apartment rents were very cheap, but 40% of the people in Moscow had to share an apartment with strangers in a communal arrangement where in a three-bedroom apartment, three different couples or families would have their own bedroom, but share the kitchen and bathroom. Even with this kind of rationing, there was a wait of many years to get any apartment at all. University graduates were assigned to state enterprises based on the need of the enterprises and not employed in their ideal jobs. The ideological pricing and communist management of the economy resulted in massive shortages of food, clothing, shoes, soap, etc. This was the exact opposite of a consumer society. Russians had to spend hours a day standing in multiple lines to buy food, clothes, toilet paper, etc. Automobile ownership was a dream. The famous newspaper Pravda was only 6 or 8 pages and no Western newspapers or magazines were allowed. Everything was censored and all news slanted to show that communism was the best system and how bad people had it in the West. Russian were shocked when they were told that America had landed a man on the moon, and this was one of the triggers which destroyed the myth that communism was the wave of the future. Travel to Eastern Europe was tightly controlled and usually whole families could not travel at the same time because so many people were defecting. Travel to the West was virtually impossible. Russia was a contradiction. On the one hand, it was a superpower with hydrogen weapons and missiles; on the other hand, it couldn't make a ball point pen or even a decent pair of shoes. There were few phones. Quality of manufactured goods was terrible. Service was terrible. Yet many in the third world looked to Russia as the economic model to copy. I remember in 1964 my instructor in an economics course at the University of Texas insisting that the Russian economy would overtake the American economy because it was growing twice as fast. One of his errors is called the "fallacy of linear projection". Another basic error was his assumption that Russian figures were factual -- they were false. Yet his views were common in academic circles in the United States in the 1960s. After the fall of communism, we learned that the Politburo, the highest ruling body, used CIA estimates of the Soviet economy obtained by their spies to make decisions because the falsification of economic numbers in the Soviet Union was so rampant as to make them useless! In 1969, tourists could see the failures and contradictions of communism everywhere with slogans on rooftops and Russians standing in lines. At the airport, dozens of soldiers patrolled with machine guns. The customs officials were soldiers who looked at every page of your passport with suspicion. Tourists were totally silent while in these lines. You could see some people inside the city limits of Moscow using wells to get water. Food quality was poor and boring. Service was very slow and indifferent. There were key ladies on each floor of your hotel to store your key and monitor your activities. At the Bolshoi Theater, when patrons left, they either walked to the subway station or they got into a chauffeured car -- communism was supposed to be a classless society. The class system was also obvious in department stores and restaurants. The best stores and restaurants would not accept rubles, only dollars and Western currencies! Russians were not allowed to shop in these stores because they were not allowed to have dollars (officially). There were few cash registers in stores and most transactions were hand calculated on abacuses. On the streets, the black market was active and you could get 3 or 4 times the official dollar-to-ruble exchange rate. All tourists were approached by Russians who wanted to buy their clothes. Blue jeans were a favorite. East Germans tourists pointed out to me that most Russians didn't even have curtains on their apartment windows. I met a Costa Rican medical student who had a Russian girl friend and was able to see how people actually lived in their communal apartments. One positive: the subways were clean, on time, and cheap. When I returned home in 1969, I told my friends that I was certain that Russia would never have the standard of living that the United States enjoyed in 1969 with a communist system. My prediction proved to be correct. Of the 100 countries that I have visited, I rate the Soviet Union in this period as the most pro-American at the individual tourist level. This seems surprising because Soviet propaganda was constantly attacking America and, yet at the same time, holding up the United States as the yardstick to measure progress in the USSR. Russians were intensely interested in talking to Americans and learning what we thought in spite of laborious language work-arounds. We were special. A minor example: you would have to share taxis and Russians ­ complete strangers ­ would always insist on paying the fare when they learned I was an American. In 2003, American tourists are commonplace and no longer special. This is progress. In 2003, one is struck how far Russia has come in normalizing itself. It is no longer cut off from Western standards and institutions. It is really amazing to see this transformation and realize it was accomplished without a bloody revolution or cataclysmic upheaval that could have sent millions of refugees pouring into other countries. The end game of communism destroyed the value of the ruble and the savings of tens of millions, thus throwing millions of seniors into abject poverty. I cried seeing some toothless, infirm great grandmothers selling flowers. The first things you notice in 2003 are signs and advertising, some in English. Then there are the cars. 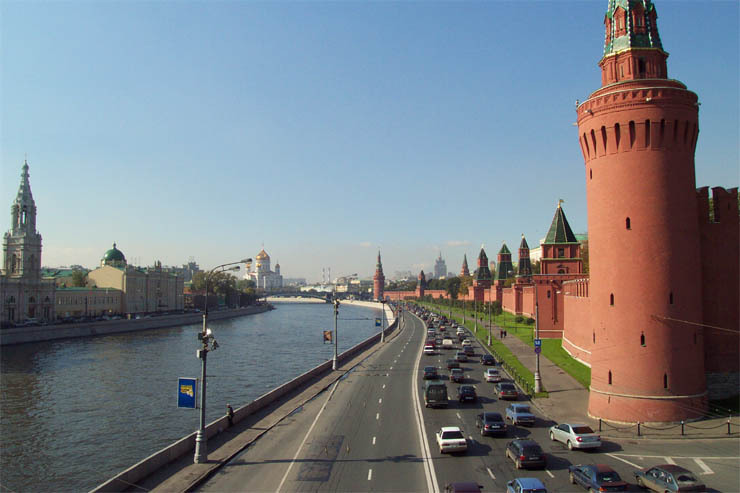 There are now 3,000,000 cars in Moscow and half of them are foreign. 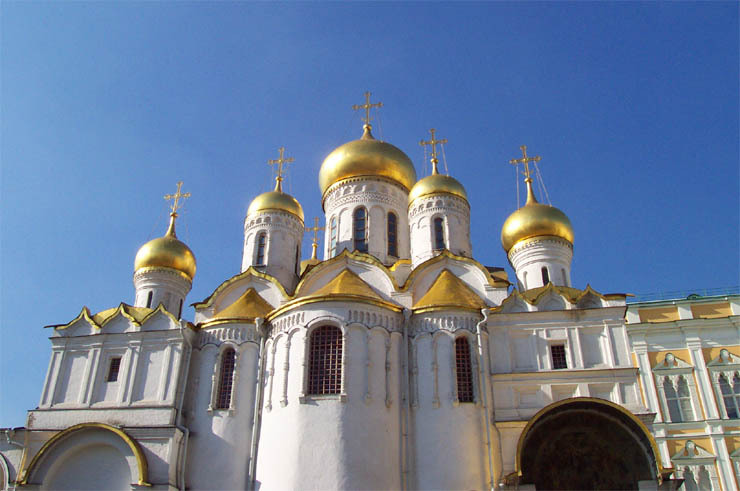 You also notice that many churches have been restored and the cathedral across from the Kremlin that Stalin had dynamited in the 1930s has been rebuilt. Moscow is in the middle of a building boom. There are cranes everywhere. People are better dressed than ever before. Food is good, certainly for tourists. The best hotels are up to world standards and Moscow is very expensive these days. There is a daily newspaper in English called the Moscow Times, started in 1990, and now expanded to 24 pages. In 2003, the number of cell phone users increased 40%. As the first impression wears off a bit, you realize that the dramatic changes in Moscow have partially reached the countryside. Yes, there are some totally new communities and some new construction in other cities, but most of the population is still living in apartments built in the communist times with the shoddy construction that characterized the whole era. So the past creates a kind of physical inertia that will take another generation or two to replace. There has been a dramatic change in the thinking of people and a move away from a soviet-style mentality; however, 30 or 35 per cent of the people are nostalgic for "the good old days" when Russia was a superpower and there was order and certainty. This will also take another generation to further eliminate. One of my tests will be to see what happens with Lenin. When he is buried and when all of his statues are removed, then Russia will be completely normalized. On the statue issue, Russians explained that Lenin is part of their history, but I countered that Hitler is part of German history and yet there are no statues to Hitler in Germany. Russia has a number of hurdles as it continues to normalize and to eliminate the communist system. One is to allow the ownership of land. Land can be leased, but not owned. Back in 1990, I was amazed to read an article in the Moscow Times which pointed out that concept of private property was necessary for civilization. This is a fundamental point that the communists never understood. Russia, has made a profound movement in the right direction, but establishing fully the rule of law and private property are necessary to insure that the current reforms are permanent. In Russia, even something as basic as a mortgage is still not common. Russia is not yet a member of the WTO. Today the Russian economy is ranked 10th in the world just below Brazil's. I'm optimistic for Russia and look forward to a future visit. 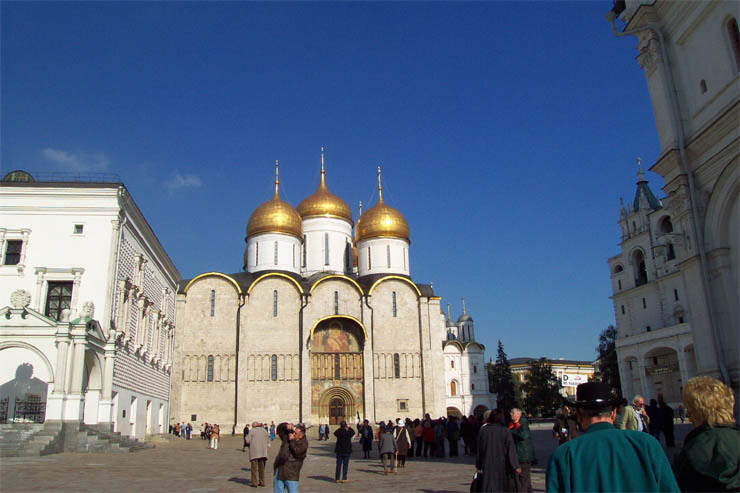 The golden domes inside the Kremlin (walls built in 1498) were resplendent this visit. Red Square, with the GUM department store, between the Kremlin and St. Basil's Cathedral. Walls of Kremlin along Moscow River with Stalin Skyscraper and re-built Cathedral in distance. 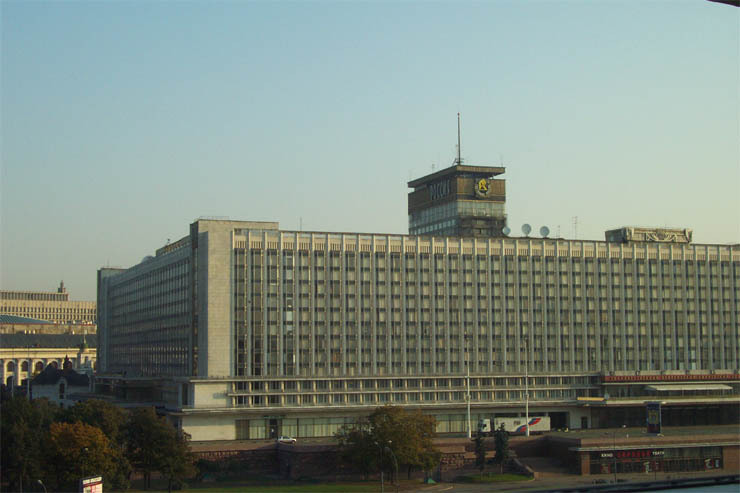 I stayed at the Rossia Hotel in 1969 and 1989. Origin of Romanov dynasty in small building at left. 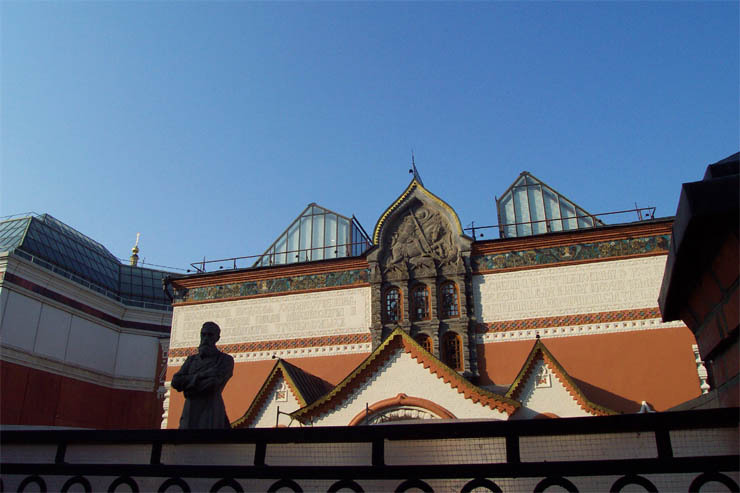 Entrance to the fabulous Tretyakov Gallery of Russian Art. Do not miss it. 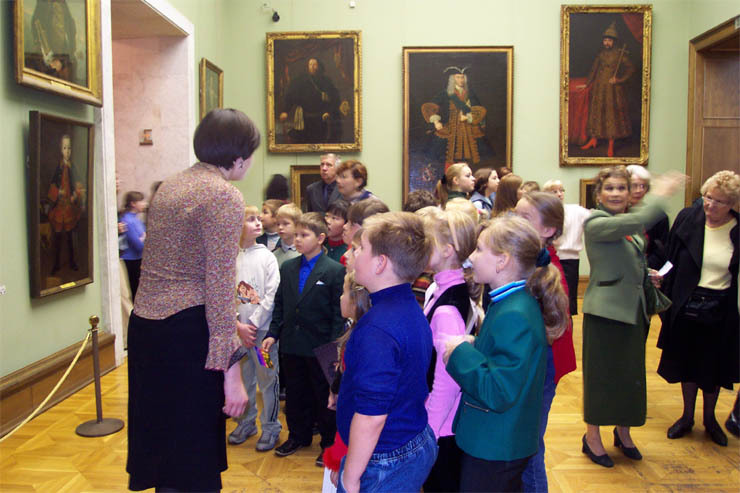 Russian school children visiting Tretyakov with some Circumnavigators on the right. Chapel for the Czars inside the Kremlin. A brilliant sight on a bright blue September day. All of the communists seem to have been replaced by tourists inside the Kremlin walls. 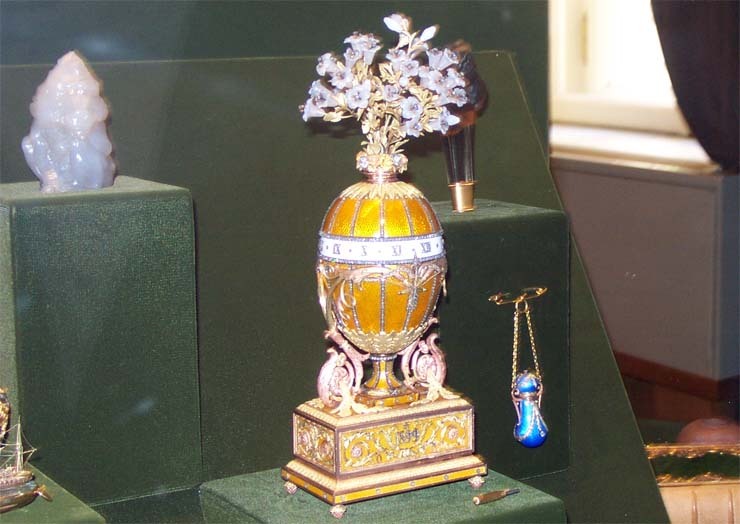 Examples of treasures from the Kremlin Armory. 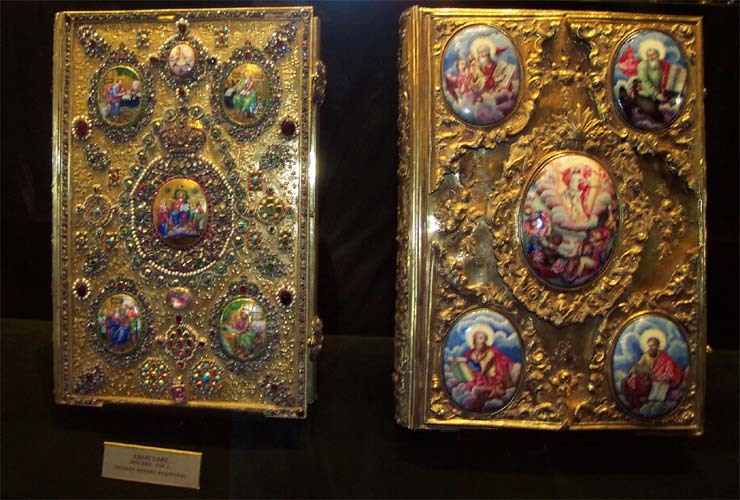 Jewel-encrusted bibles. 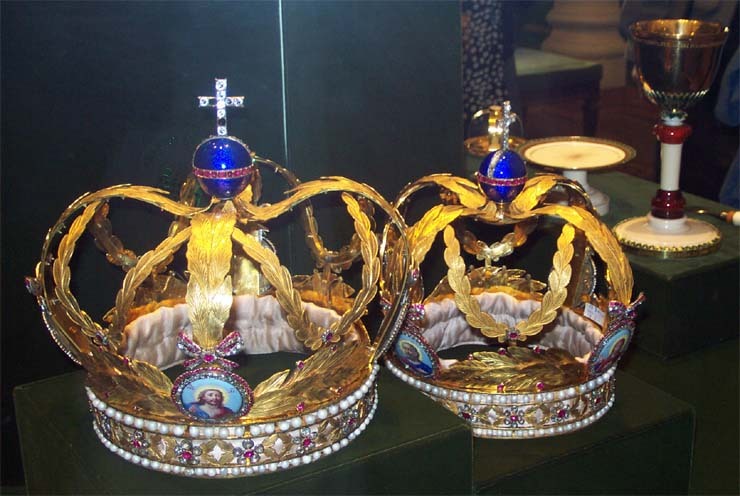 Crowns for the Czars. Another typical treasure, a clock for the Czar from 1899 which rotated to tell time. 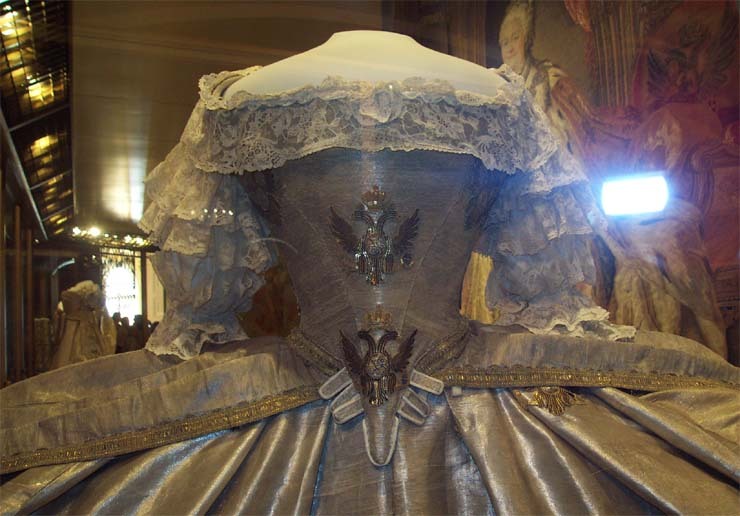 Catherine the Great, in background, was a ample woman later in life, but she had a 16 inch waist at marriage.